Golden and clear curved crystal cluster features three really rare curved crystals to 3/4", and a translucent, sensuously double curved glittery plate bottom with sandy ribs. A burst of crystal clear crystals 1-1/4"x 3/4" tall expands up from golden healer crystals along the cluster - suggesting this would be a great addition to a reiki healer's cabinet. 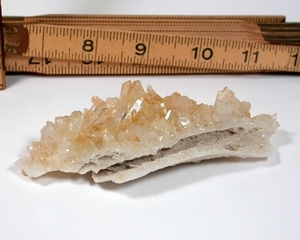 2-1/4x 4-3/4x 1-1/4" tall from the Collier Creek Mine in Arkansas.